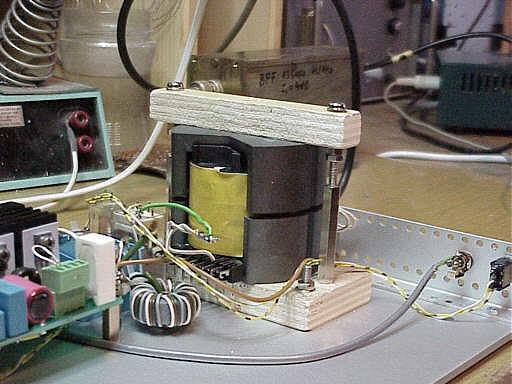 DK5PT's compact ferrite loading coil for LW antennas. What I am using for LF antenna matching is a relatively small ferrite pot-core instead of big coupled air coils. Pot cores are primarily used for power transformers in switching supplies , not usually for high Q coil applications. The core is a SIEMENS PM74/59 with 74mm diameter. The ferrite is N27. Some of the parameters used for calculations are: Ae: 630mm2 (magnetic area) Al: 10.000 nH (inductance per n2 without gap) Bsat : 350mT (saturation flux density for N27 at 25C) When using the PM74 without airgap, only a few turns are necessary to achive the desired inductance of 1.5.....4mH. But unfortunately the unloaded coil Q will be low (test result: Qu»30...50). To overcome that problem and to make the L variable, the upper half of the core is made moveable. The construction is very simple. The lower half of the core is fixed to a wooden plate. Two spacers and a wooden rod hold the upper halve . Additional M4 srews make it movable. (see pics) To increase Q the air gap should be a few millimeters. All the available space inside should be filled with wire. I used bifilar winding ; 2x 60 paralleled turns of 2 mm braid have been used. Moving the upper halve, the L could be variied in a wide range. My antenna is 10m vertical with a capacity hat made of two long wire antennas (80m and 30m). The capacitance of that construction is about 900pF. To resonate at 136Kc, 1.45 mH are needed. This can be achived by adjusting the gap to about 3mm. Measurements: (signal generator, oscilloscope) Unloaded Q=200 (resonated with high quality capacitor) Loaded Q » 38 ; (resonated with antenna) The wL at resonance is 1240jW, Out of that the total loss resistance can be calculated to be 32W. The loss of the unloaded coil is 6.2W. Assuming that the total loss is the sum of coil loss and earth loss, neglecting the radiation resistance, the earth loss in my systen is about 26W (and assuming,that I did not make a mistake, hi). Limits: Of course there are also some disadvantages using ferrite cores. One limitation is the saturation effect. The max. usable flux density is about 300mT (V *sec/m2) for N27 material. The equatation for checking saturation Bmax=(Upeak/wxNxAe) Solving that equ. for Upeak and using the core data and number of turns=60 the max. usable peak voltage across the coil is ±9600V at 136Kc. This result seems to be a little theoretical, due to wire insulation. My Tx is a low power pa, with about 15W input pwr. Measured coil ( antenna) current (with a Tektronix current probe) is 1.3App (~0.5 A rms). Antenna Voltage: 1240W x 1.3 App=1612Vpp ; Measured 1600Vpp (with a 1:100) probe, which is very close to the theor. value. Note: Dieter has since improved the insulation and now uses 300W with this coil. Conclusion: Ferrite pot cores with air gap can be used for LF antenna matching in the low to mid power range; high power applications are limited by core saturation and/or wire insulation.